After parting ways with her troubled mermaid tribe, Luce just wants to live peacefully on her own. But her tranquillity doesn't last long: she receives news that the tribe is on the verge of collapse and desperately needs her leadership. The tribe’s cruel queen wants Luce dead. Dorian, the boy Luce broke mermaid law to save, is determined to make her pay for her part in the murder of his family. And while the mermaids cling to the idea that humans never suspect their existence, there are suddenly ominous signs to the contrary. Dorian scraped and washed his plate. It was important to keep going through the motions. Convince them that he hadn't been driven totally crazy by the trauma. It was bad enough that he screamed in his sleep sometimes. They were probably already afraid that he was going to come after them with an ax. There was only one explanation for his absence that seemed at all likely to her. It must be that he enjoyed playing with her emotions. Maybe this was his way of getting revenge. "Perhaps someone will change that story. Perhaps you will, Luce. Then the story will be new, even for me. I would be very pleased if that were so." 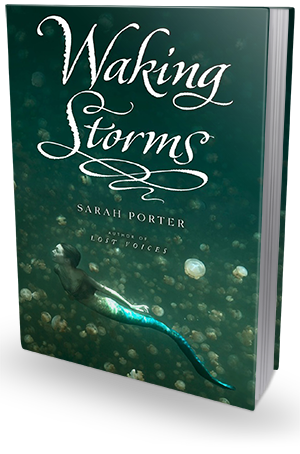 Sarah Porter's lyrical and stunning writing has returned, and swept me off of my feet. Waking Storms was a perfect second instalment for this trilogy. The plot and world were already well developed from Lost Souls and the characters were established, so we had room for forward movement. This book was more about the coming change and what it will take to get there, and what you can give up, choice or not just to get there. Waking Storms carried the romance that Lost Souls did not. Oh sure, some books do not need romance and Lost Souls did just fine without it, but I found it made this book richer and gave it an edge. So much is at risk however. Mermaids are not meant to talk to, or associate with humans. Luce is going against most of what she believes, and with the evil Anais (I dislike her with most of my being) the relationship could mean death. Anais is about control, she wants absolute submission to her and no matter what the rules were before the Mermaids are to play by hers now. This only makes everything that much more tense knowing that her old tribe needs her but she is now torn between what she wants, and what she has done. Luce is hardly a beacon of perfection, but she is a fourteen year old girl that will never have the chance to grow up. This being said she has a concious and has held on to it when so many others have let theirs slip away. She hates that she is breaking the rules that have been in motion for so long, and yet her heart can't break away. She practices what she believes could change everything for Mermaids, but doesn't know how to change the others minds. I found myself at times irritated that she had this beautiful power and yet could not gather the strength to save the ones that had been with her at the start, or even step forward to prevent the destruction that was Anais. Dorain was not the love interest that you swoon over, nor was it a simple love. He feels both hate and attraction to Luce and often can't seem to stop himself from saying something that cuts her. I liked that they weren't perfect because no relationship where one is the cause of the other losing their family. However, it is clear that Dorian never forgets but he does live with this fact. He easily falls for Luce and grasps that she is different and yet he cannot accept that her difference causes her to take risks. Though I do feel that Porter has made the romance perfectly and with a purpose. Even if you are a mermaid and you are fourteen you have to experience something right. There is no denying that this series is only getting better. Every part progressed, and yet it still held heart break. It is this that makes me believe that there must be something coming around the corner and the next book will only be better. The pacing is really picking up and the plot is thickening, with danger pulling at Luce from every direction. Pick these books up if you are a mermaid fan, that wants something different, or if you are not a fan of mermaids that are pure good. 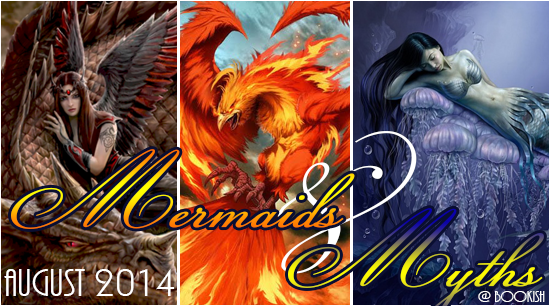 Because these mermaids will pull you in with their tragic story.